All the legends are true. Below, watch three new Shadowhunters TV show teasers from Freeform. Shadowhunters season two premieres with, “This Guilty Blood,” on Freeform, Monday, January 2nd, at 8:00pm ET/PT. The series stars Katherine McNamara as Clary Fray. Dominic Sherwood is Jace Wayland. Alberto Rosende plays Simon Lewis. Emeraude Toubia portrays Isabelle Lightwood. Matthew Daddario is Alec Lightwood. Isaiah Mustafa plays Luke Garroway. Harry Shum Jr. is Magnus Bane. After Jace leaves with Valentine, all hell breaks loose. While, Alec, Isabelle and Clary are desperate to find Jace, Victor Aldertree’s arrival stops them in their tracks. It seems Victor is serious about getting The Institute back on track. That said, getting the New York Shadowhunters in-line with The Clave conflicts with the plan to rescue Jace. Meanwhile, Jocelyn has a lot to catch up on now that she is awake. What do you think? Are you a fan of the Shadowhunters TV series? Do you plan to watch season two on Freeform? Sound off, in the comments. 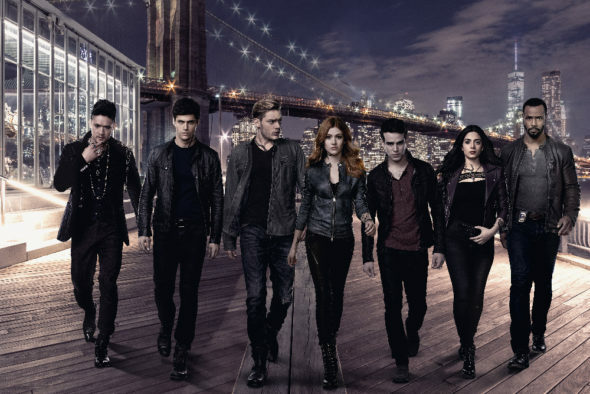 More about: Shadowhunters, Shadowhunters: canceled or renewed?